How we select the best tone wood for our tops at Homestead? Because 80% of the guitar sound is determined by the top, Homestead chooses the best wood for its tops, namely Adirondack (Picea Rubens) AAA. This red spruce can only be found in the east of the US and Canada and is harder than other spruce trees like Sitka and Engelmann. Adirondack therefore stands for more volume, expression and a longer sustain. 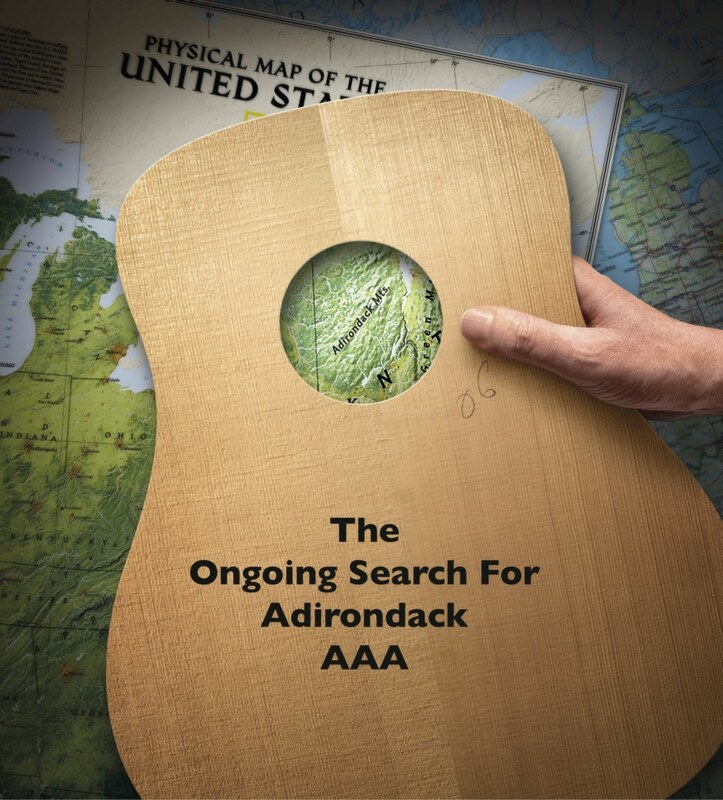 In order to have enough suitable wood available for our guitars, we spend a lot of time selecting the best quality (AAA) Adirondack from our American suppliers. What are we paying attention to? In the first place it concerns the number of grains per inch. The more grains, the stiffer the wood, the more beautiful the sound. The main point here is to find Adirondack trees that stand on the cold north slopes of the mountains and therefore grow slowly. For the AAA quality we use a minimum of 12 grains per inch on that part of the wood where the grains are the furthest apart. A second selection takes place on the basis of the uniformity of the color. Some pieces of wood have uneven patterns in color. This has no effect on the sound, but looks less beautiful. Light color nuances are inevitable, it remains a natural product. But with AAA quality, this must be minimal. Spruce wood has a visible cellular structure perpendicular to the growth rings. This is called ‘Medullary Rays’. They are formed by the activity of fascicular cambium. In its growing process the cambium cuts out cells between the outer and inner side. These Medullary Rays look like silver lines that light up between the veins. Now the fact that, when not 100% quarters is sawn, the silver lines disappear and that is detrimental to the sound. Many woodworkers prefer not to see 100% quarters because they can use more wood. At Homestead we only select the 100% quarter-sawn sawn specimens. Furthermore, there must of course be no irregularities in the wood. Irregularities can be: knots, buts, burls and cracks. There is one exception, the so-called ‘Bear claws’. These ‘bear claws’ are a kind of white colored wave formed scars that run asymmetric to the veins, hence the name. Bear claws, however, have nothing to do with bears, but everything with the growth pattern of the spruce. Bear claws are caused by small interruptions in the growth process of the tree. Bear claws are very superficial and therefore are not mirrored when splitting the wood. Bear claws therefore have no negative effect on the sound, but give a unique character to the appearance of the guitar. That is why these ‘scars’ often have a positive influence on the attractiveness and price of the wood. From each piece of wood, our American suppliers first take a photo in high resolution and we then assess them on the basis of the above mentioned criteria. Only the best pieces of Adirondack are purchased by us. That’s why our guitars sound so good!